There's no limit to how many Flower Girls and Page Boys you can have, and it will certainly make your little loved ones feel important on your big day. They don't have to walk down the aisle in the ceremony (this often proves a little too overwhelming), but if you choose to have them do so make sure you practise lots beforehand! Great for cuteness factor, or as an important job for a slightly older boy. Have them sat on one of the front 2 rows, so they're able to get up and present the rings at the correct moment. An important job for older children, and a great option to do in pairs or in a small group. Make sure you're 100% confident that they will feel comfortable doing this job, many adults would find it daunting! Here are some children's book readings which may be nice. 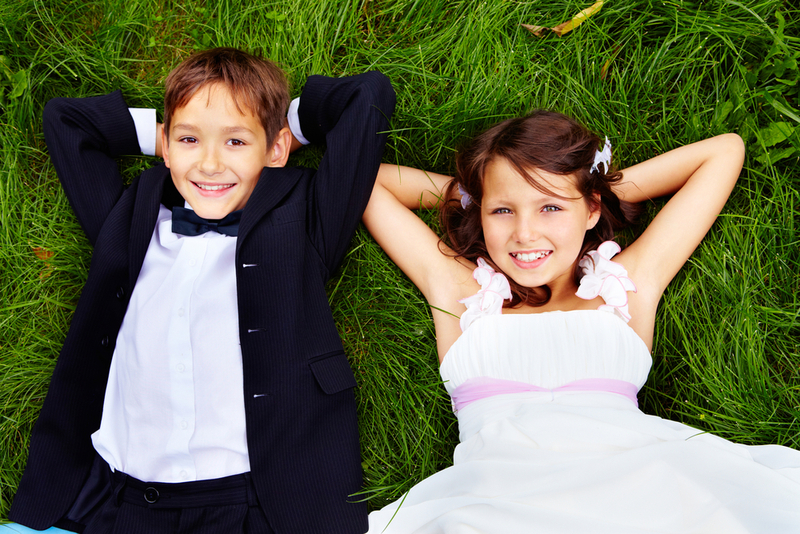 A lovely job for flower girls or extra children who you'd like to feel included in the day. Have the ushers give baskets containing confetti to these children at the end of the ceremony, and ask them to hand it out to guests. Have ushers distribute tambourines amongst the children before the ceremony and instruct them (and their parents) to keep them quiet until it's time for applause (i.e first kiss, exit, confetti throw etc.). They can then hold on to the tambourines and enjoy shaking them until they annoy you. A great way to capture adorable candid shots of your wedding day through the eyes of the children in attendance. Give them a list of 'must have' shots and a disposable camera and be prepared for some funny/cute/blurry results! A wonderful idea to involve kids of all ages, with several potential ways to go about it. Either draw up a giant picture of the wedding and have the kids colour it in. Or, have them each create something small and then piece it together into a montage after the big day. Overseen by the ushers, ask children to hand around baskets of wedding favours to each table whilst coffee is being served.